President Shimon Peres sat down Tuesday evening with dozens of young hareidi Torah students from yeshivas including the Mir, the Hevron Yeshiva, and Ponevezh. The meeting, organized by the Leil Shishi Aktuali forum, aimed to allow the young students to express their views on current events that affect their community, and to hear Peres’ response. The students’ top concern was the level of discourse in Israeli society, and in particular, the strong anti-hareidi sentiment that they have experienced in recent months as the government debates hareidi army recruitment. They told Peres that the state of Israel is their home, and that they feel the trust and respect that once existed between different communities within Israel is gone. The focus on hareidi enlistment has led to a campaign to delegitimize the hareidi way of life, they said. The religious Jewish world places a high value on Torah study, particularly for Jewish men. 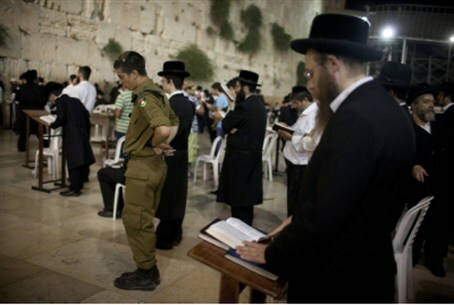 In the hareidi community in Israel, most believe that full-time Torah study is preferable to IDF service, and that men who can afford to study Torah rather than work should do so. Peres listened to the young students, then explained his views, which include a heavy emphasis on hareidi participation in the workforce. “There’s no contradiction between keeping the 613 mitzvoth [commandments] and getting an academic degree. Higher education is a condition for well-paid work that allows people to live with ease while keeping the mitzvoth,” he argued. “One shining example is the Rambam, who was a great rabbi and a brilliant doctor,” he added. The Rambam (Rabbi Moshe Ben Maimon) was an influential Torah scholar in the Middle Ages who studied Torah full-time for many years, and began working as a physician after much of his money was lost when his brother drowned at sea. He expressed firm opposition to discrimination and attacks against hareidi Jews, and said he respects the Torah students who keep Jewish tradition and culture alive.